While searching in old books and newspapers, I discovered yet another person using the name Kanistanaux and practicing medicine. Today I will outline the few bits and pieces I found for him. In the 1880 Census, I found an Isaac Kanistanaux, a Native man, practicing medicine in Addison, Steuben Co., NY. He was single and born in New York about 1837. I was not able to find him in any other census, before or after. The following notice was found in the “Journal” of Corning, NY on 31-Jan-1889 in the “Lindley” town section. Dr. Kanistanaux, of Keeneyville, is working up a large practice in this place. Keeneyville is located in Pennsylvania, about 20 miles due south of Addison, NY. Lindley is in New York State part-way between the other two towns. The news clipping doesn’t tell me if this is a man or woman, but it is a good possibility this is the man at Addison in 1880. I found “D. Kanistanaux, M.D.” sharing medical formulas with other doctors in the July 1892 issue of “The Doctor. A Quarterly Journal of Medicine and Therapeutics”. The Dr. was from Little Marsh, PA. I am not too sure if this is really a professional quarterly. It is published by a drug company and it seems all the contributors provide a glowing recommendation for the company’s products (Peacock’s Bromides & Fucus Marina) in return for a little space to share their own favorite formulas. It doesn’t seem too impartial or scientific to me, but I suppose it was of great value to doctors of the time period to be able to share pharmaceutical data. I have no way of knowing just when the Doctor contributed this item to the quarterly, but it certainly was before the publishing date of July, 1892. Little Marsh is a village in East Chatham, PA and located less than 10 miles west of Keeneyville. My next encounter is from a Professional Directory. Here the listing is nothing more then the name “Kanistanaux” under the town of “East Chatham, Tioga”. This is found on page 135 in the “Physicians of Pennsylvania” section of “The Medical, pharmaceutical and dental register-directory and intelligencer …” produced by George Keil in 1895. This one provides the initials “I.J.” which helps to connect the dots from Isaac in Addison, NY to East Chatham, PA. Too bad it didn’t connect the dots between this man and the rest of the Kanistanaux folks. 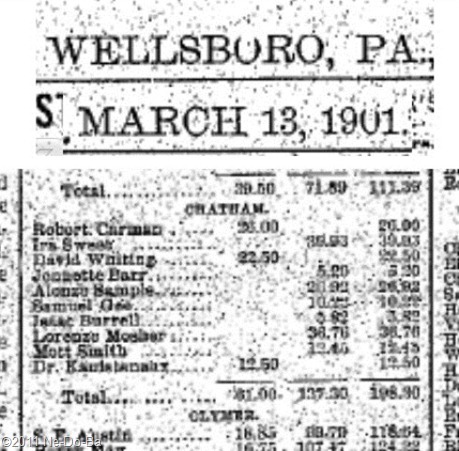 The final item I found online is a published list of recipients of Tioga County aid dated March of 1901. Under the town of Chatham, It shows Dr. Kanistanaux received county aid in the amount of $12.50 to pay for a physician. It appears the good doctor has fallen on hard times and needs the assistance of the County and of another doctor. I now have good documentation placing a Dr. Kanistanaux in East Chatham just before and just after the turn of the century, but a page by page search in the 1900 Census of several surrounding towns did not locate him. While researching this fellow, something pretty cool happened. I was contacted a few weeks back by a family going through old family papers. (A genealogist’s dream come true!) They had found a letter written in 190_ by a Dr. Kanistanaux and were trying to determine who the person was and why they had the letter in their family papers. The family is from Little Marsh (East Chatham), PA. Here is a link to the entire Dr. Kanistanaus Letter in pdf format with a full transcription. The part that is of most interest to this project follows. Although the letter does not answer any of my questions about the man, it does provide a variety of general information which may help sort things out at some point in the future. Here is a summary of the key points. The person writing the letter was at least a child old enough to remember the people in their life during the period of 1861 to 1865 (the Civil War!) [so probably born no later than 1856 (5 years old in 1861) and possibly much earlier (perhaps he was a soldier in the war)]. The woman being written to was older – old enough to act as a “mother” during the same period [so born before 1846 to be at least 15 in 1861, and likely much older]. The two have not seen each other for over 30 years. The woman being written to is losing her sight. The woman being written to has a daughter named, Mary, whose husband, Joseph, has recently died. The person writing the letter worked for a man named “B. R. Wilson” who had a daughter “Annie“. Mr. Wilson has recently passed. Mr. Wilson and Annie appear to be mutual acquaintances of Mother Hazard and Dr. Kanistanaux. The person writing the letter has “taken” their “Old Indian Name” which suggests they did not use the name before and perhaps was not known by that name to the person being written to. I do not know what name this person used before taking the name Kanistanaux. The person writing the letter seems to be Native American and a member of the extended Kanistanaux family group. It appears the person writing the letter began to practice medicine sometime after the Civil War. Just who is Isaac and where does he fit in the Kanistanaux family? His age makes him too old to be a child of Marleah and Layton. Perhaps he is a brother to Marleah and the older Lee-o-netto. Perhaps he is a brother to Layton Kanistanaux. Perhaps he is someone else. I certainly have not figured it all out yet, but I have learned a little bit more about the man and where I might begin my search for additional pieces of the puzzle.